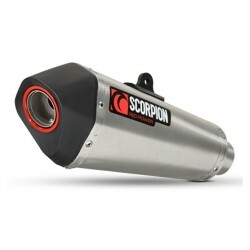 Honda's CB500X & F range has now felt the benefit of Scorpion's dedicated R&D team. They have developed a Serket Tapered silencer to work with the bikes original fuelling. The CB is an ideal bike for the Serket silencer and gives you perception of riding a much sportier machine, both in terms of looks and sounds. 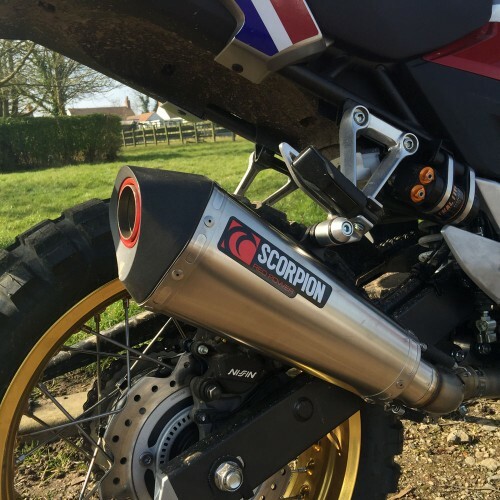 Scorpion also have a customer "damage guarantee", where if the customer damages the original can, by crash damage, then they will offer a replacement at 50% discount, plus shipping costs, subject to the customer returning the damaged can to their UK HQ first. The silencer is brushed stainless-steel, along with a stainless mid-pipe. Fitting this silencer gives a 1,1 Hp gain, 1,7Kg weight saving and an increase of 1,5 dB in noise.